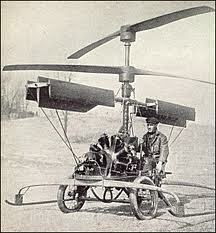 Description This coaxial helicopter was the second attempt by Emile Berliner to design a vertical flying machine. It had an unconventional solution for direction control by using vanes to vector the downwash. It made several hops but, like many others designs in this time-frame, proved to be unstable. This coaxial helicopter was the second attempt by Emile Berliner to design a vertical flying machine. It had an unconventional solution for direction control by using vanes to vector the downwash. It made several hops but, like many others designs in this time-frame, proved to be unstable. Do you want to comment the Emile Berliner Coaxial helicopter helicopter?